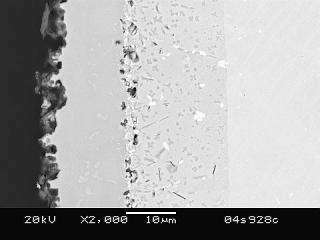 An electron micrograph of a coated 316 stainless steel coupon in cross-section shows the diffusion-reaction layers. Starting from the left hand side of the photo, which is the surface of the steel the following layers are visible: 1) Aluminum oxide outer layer (not visible at lower magnifications) 2) FeAl layer, 3) Fe3Al inner layer, and 4) 316SS. Researchers at Pacific Northwest National Laboratory have developed a new ceramic-based coating for steel and superalloys that prevents corrosion, oxidation, carburization and sulfidation that commonly occur in gas, liquid, steam and other hostile environments. The low-cost, easy-to-apply material is available for licensing and joint research opportunities through Battelle, which operates PNNL for the Department of Energy and facilitates the transfer of lab-created technologies to the marketplace. The new coating bonds with the metal substrate and is “resilient, inexpensive and simple,” said PNNL scientist Chuck Henager. Because the coating is fabricated at significantly lower temperatures than typically required for conventional ceramic coatings, the new process also can save energy and reduce harmful emissions, he said. Researchers created the coating by mixing a liquid preceramic polymer with aluminum metal-flake powders to form a slurry that can be applied to a metal object by dipping, painting or air-spraying. A low-temperature curing process follows, using a commercial Ruthenium-based catalyst that enables polymer cross-linking and dries the slurry to a green state. The coated steel is then heated in air, nitrogen or argon at 700 to 900 degrees Celsius. The heat converts the green state layer into an aluminum diffusion/reaction layer that permeates surface of the steel and provides an aluminide surface coating on the steel. According to PNNL Commercialization Manager Eric Lund, the diffusion reaction makes the coating so durable that it can’t be chipped or scratched off. The reaction layer on the surface of the steel is much stronger than an external coating because it is an integral part of the steel, Henager said. This layer develops during use as the coating is heated at very high temperatures, such as those that occur with the heating of pipes in a process facility. Unlike similar products, the liquid form of the coating can be applied with a spray gun. This feature makes the PNNL coating practical for protecting large areas, researchers said.